Along with the coding, the works continue on the new terrain. Albert has finished with the dry dirt and he is now experimenting with patterns for other kinds of terrains like grass or snow. We are aiming for at least two "biomes" combining similar kinds of terrains. The terrain is quite a different task from modelling the machines or the enemies. Therefore there is a lot of researching and experiments involved. Kuba has provided a big help to Albert by generating various noises and tileable patterns for him to work with. After the 0.7 release we got some complaints that the game is using too much video memory. Some players couldn't even load the game for this reason. The 0.7.2 fixes this by providing the low resolution mode (in the graphics settings, needs a restart). In this mode, some of the sprites are scaled down before loading into the atlas. The resulting quality is lower, but the game will fit within 256MB video memory. You can compare how the game looks in low resolution (left) and normal mode below. The difference is naturally most visible when you zoom in. Enabling the multisampling will improve the quality and make the low resolution mode look real close to the regular one. Last but not least, we have started with the new trailer. So far we put together some basic ideas for the scenes and started preparing the map where the trailer will be created. 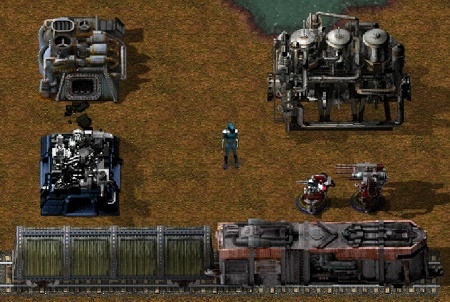 Actually the trailer will be a regular Factorio scenario so after it is finished anyone can load it and "replay" it directly in the game (except for the music though). As usual you can post comments regarding this post at our forum.